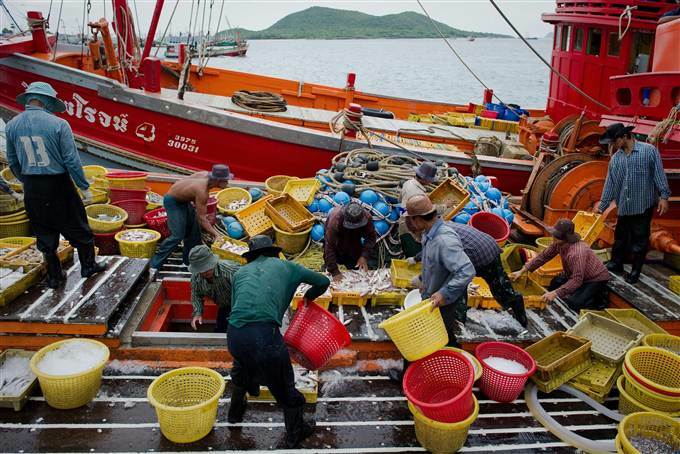 Migrant laborers sorting fish as they work on a Thai fishing boat in Sattahip, in Thailand’s Rayong province on September 1, 2011. Thousands of men from Myanmar and Cambodia set sail on Thai fishing boats every day, but many are unwilling seafarers — slaves forced to work in brutal conditions under threat of death. GlobalPost’s award winning 2012 investigation “Seafood Slavery” tells the grim saga of escaped slaves lorded over and tortured by Thai captains. Those who resist are often murdered. Following reports from Human Rights Watch, the International Labour Organization and others, the latest exposé into Thailand’s seafood industry comes from the London-based Environmental Justice Foundation. The investigation builds upon a mounting pile of evidence that this global trade is propped up by vicious practices. But so far, there is little indication that this netherworld of slavery will disappear — despite its well-documented role in delivering fish to Western supermarkets. Here are five reasons Thailand’s seafood slavery problem will likely persist. Just as drug money is laundered of its illicit origins, so is slave-caught seafood. The captive workers toil on unregistered “ghost ships.” Their catch is transferred to colossal motherships far out at sea, where it is mixed with fish from other vessels before being offloaded to fishmongers at the docks. These steps are practically impossible to trace. In fact, ghost ships need not dock for years on end. They’ll remain murky and inscrutable until either Thailand’s government or the seafood industry forces all fishing vessels to prove where and how they caught their fish. Thailand is America’s oldest Asian ally. The two nations have been buddies since the Vietnam War, when the US launched jets from Thailand to carpet-bomb suspected communist rebels. And with China now ascendant, America appears reluctant to take action that would threaten the friendship. This helps explain why America takes pains to avoid sanctioning Thailand — even though the nation is clearly one of Asia’s major human trafficking hubs. When it comes to human trafficking, the White House talks a good game. The State Department puts out an annual Trafficking In Persons report and vows to sanction nations ranked in its lowest tier. But Thailand has managed to hover just above the worst ranking for four years straight. Why? Because the Secretary of State repeatedly issues waivers to spare the government from a humiliating slide into the bottom ranks. Thailand’s forced labor victims are believed to number in the thousands. Guess how many traffickers were prosecuted in 2012? 27. Thai police don’t aggressively pursue forced labor cases on land. They’re even less likely to hunt down Thai-captained ghost ships — which are compelled by overfishing to trawl deeper into international waters each year. One ship captain told GlobalPost his fleet had once ventured as far as Somalia, nearly 4,000 miles away. Say you’re a sea slave who has defied the odds. You’ve managed to swim to Thailand’s shores, eluding capture. You wash ashore, filthy and fatigued and unable to speak the native language. And you somehow find an official willing to submit your case into the justice system. Your nightmare is far from over. Forced labor victims are typically quarantined in shelters as they pursue justice. They’re often forbidden from leaving or even communicating with family members. The rationale is well meaning; intel on their whereabouts is easily leaked to trafficking syndicates who can threaten relatives or otherwise sabotage the case. But many victims prefer to drop cases so they can return home or get back to work. This is especially true of migrants who have ventured from their far-flung villages to shore up cash for their ailing families. They simply can’t afford to wait in confinement while the justice system drags on for years. Unease over the origins of blood diamonds, non-fair trade coffee and even iPads has seeped into the American consciousness. The fact that seafood shipped to America is tangled in a slavery-tainted supply chain hasn’t. Traffickers, cops and seafood moguls in Thailand are not on the verge of a collective moral epiphany that will rid the nation of forced labor. Impoverished Myanmar and Cambodia will be full of men desperate enough to fall prey to smugglers’ lies for years to come. And Western buyers are, for now, too uninformed or unconcerned about the tragic lives of men trapped on distant trawlers to alter their shopping habits. As long as no one along the supply chain objects, trawler captains who help supply American supermarkets will continue to buy men like livestock, at $650 per head, and dispose of them at will.